Roomy romper in rich colors measures 26” across chest, 23” shoulder to ruffled hem, size Toddler (1 - 2 years, but could easily fit a 3 year old). 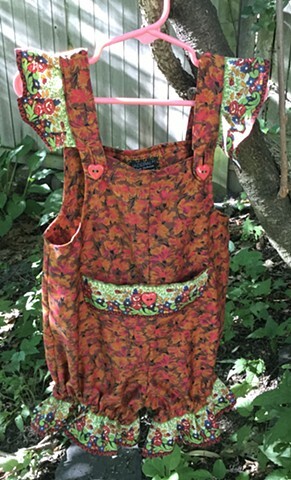 Decorative “Pierre Deux” border print on big front pocket, pinafore-style ruffles at shoulder and fun elasticized edge to bottom. 100% cotton, $90, made by the designer herself and shipped free to any address in the U.S.